In Arizona, we experience what is known as Monsoon, a season that is characterized by high temperatures, high winds, and high moisture, resulting in potentially deadly weather. Serious damage can occur from these high winds, or from debris being tossed by those high winds. Monsoon season typically starts around June 15 and lasts until September 30th. Here are some tips to help keep your pool properly maintained during this season. It is essential to check your pool after a Monsoon storm. The following preventative measure should be performed even if you have your pool regularly maintained by a pool service company. Reset your filter timer – Reset your timer for longer hours in the early afternoon and evenings. Monsoons tend to be more active during these times of the day. The Monsoon season places stress on your pool due to high temperatures, high winds, and additional debris that is kicked up by these winds. Longer filter run times will help reduce problems. Look for Debris and Leaves – After a storm with heavy wind and rain you are likely to have a lot of debris in your pool. Remove any large floating debris from the pool and check both the skimmer and the skimmer baskets for leaves and other debris. If your baskets become clogged it will limit the flow and amount of water that is being sucked into the pump. This will cause the pump to run dry, overheat and eventually burn out leading to a costly repair bill. 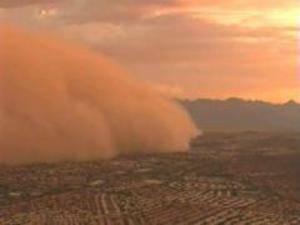 Backwash and Disassemble Filters – Monsoon season brings with it heavy dust storms. Because of this you may need to backwash your filter or disassemble them entirely to ensure all manner of debris is removed and the filter clean. Super Chlorinate After a Monsoon Storm – If you have a chlorine or Ozone pool, super chlorinating after a dust storm can help to prevent the start of algae. Use a shock that has the highest available chlorine content. To help control algae growth both before and after Monsoon Season in any pool type, we recommend a preventative algaecide and a stain preventer on a weekly basis to help prevent problems. Algae feeds on phosphates – take away the algae’s food by using a phosphate remover (Zero Phos) to help lower and/or eliminate the phosphates in your water.